This interactive day will draw on the extensive experience of bestselling author and well-known historian of the Great War, Richard van Emden. It will cover many aspects of non-fiction writing from clarifying what sort of book you want to write, how to build a narrative and getting published. It’s suitable for anyone, published or aspiring, who’s writing or wanting to write about the First World War. 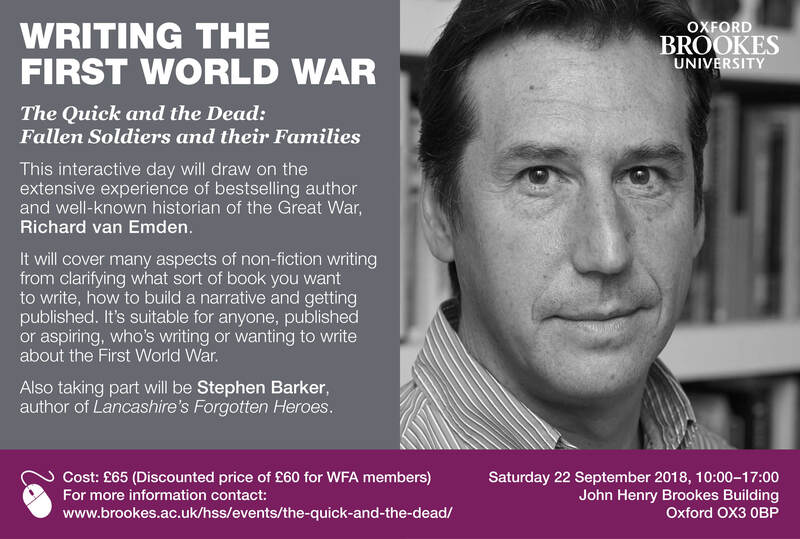 Also taking part will be Stephen Barker, author of Lancashire’s Forgotten Heroes. Cost: £65 (including tea/coffee and lunch) or £60 for Western Front Association members. Further information and how to book, see here. This entry was posted in Events and Conferences, First World War, WW1 and tagged non-fiction writing, Richard van Emden, Stephen Barker by Jeanette Atkinson. Bookmark the permalink.